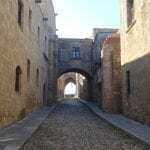 In this section of the medieval tour I want to talk to you a little on The Walls And The Gates In Rhodes Old Town. 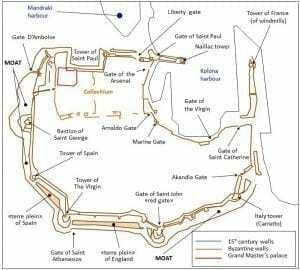 We have discussed other areas of the medieval city in previous sections, but what history lies within those huge fortification walls and gates? When you look at the actual walls, you can of course see that the laying of the stones is not set out in a traditional or ordinary pattern. Instead, they are set in what you could call an unpolished and/or imperfect way. 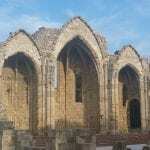 They are huge stones which have been shaped as needed and set in mortar. This style used for building is called Rubble Masonry. on this website, The Knights Of Saint John augmented and solidified them and gave them more strength. This was done when The Knights took hold of the island after 1309. This was done for a very important reason too. 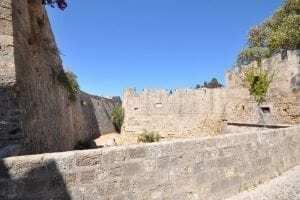 The walls now with the original Rubble Masonry and the attention given after by The Knights, have a very strong capability in that they can withstand blasts from weapons such as rifles and mortar fire. Also, the entrance with the two towers (Marine Gate and other areas) were made into a circular shape as opposed to leaving the original square shaped structures. This way they can deflect attacks from cannon fire. Naturally, set into the walls are big entrance gates. These were all guarded by The Knights from the different Langues. There are eleven gates in total. Some of them have been made into a modern standard, but some still remain in the original condition. Liberty Gate – This is one of the main entrances into the medieval city and it was constructed by the Italian Forces in 1924. I have also discussed a little more on the Italian Rule on The Street Of The Knights section. 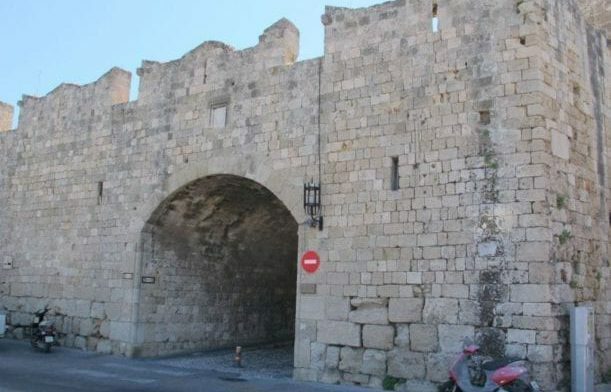 The Italians are responsible for a lot of the reconstruction in Rhodes, and this gate was erected after they conquered the island from the Ottoman Empire. Hence, the name Liberty Gate. 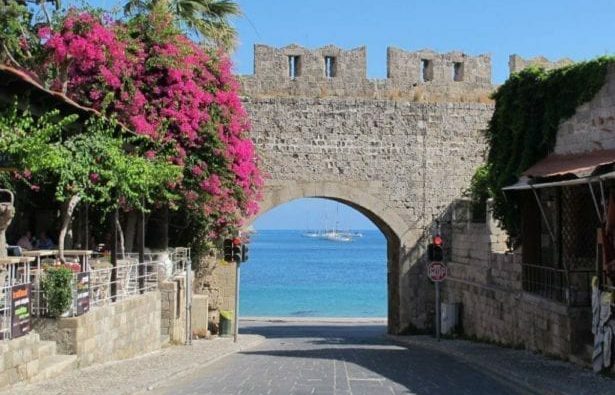 After entering the Liberty Gate area, you can head up to The Castle Of The Knights, and you can also make your way around to the Harbor of Rhodes. 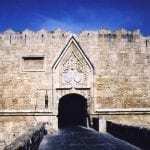 Gate Of The Arsenal – This gate was constructed by Juan Fernandez De Heredia who was the appointed Grand Master Of The Knights from 1377 until his death in 1396. His Coat Of Arms is also on display on the gate. It is located to the left as you drive through the liberty gate and the building on the right is now home to the Electric Office. The Gate Of Saint Paul – This gate was built during the 15th Century and its prime purpose was access. At the time of construction, it offered an entry point into the Old City and also a path to the Harbor. This harbor is called Kolona harbor. It might be interesting for you to know that during World War Two, Saint Paul’s Gate was hit heavily and almost fell. It was rebuilt early in the 1950s! the very noticeable and huge towers. This gate also suffered a lot of damage in The Second World War, and like Saint Paul’s Gate, it was also rebuilt in part at the beginning of the 1950s. When you look at this gate, you will see that the structure itself is very close to the water, and therefore it was one of the strongholds during the conflicts in earlier times. It was almost impossible to breach this entrance! The Gate Of The Virgin – The location of this gate is next to a church which is called The Virgin Of The Burgh. Burgh is also known as ‘Chora’ and it means ‘Space’ in ancient Greek and here it refers to the Main Town. This gate is said to have been designed by the Italians during their presence, but it actually opened in 1955 under Greek Legislation. 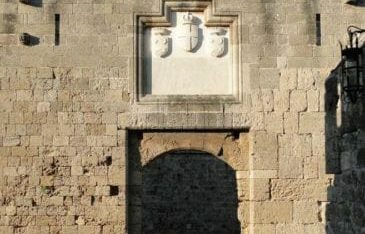 Arnaldo Gate – The Arnaldo gate is a small entrance that allows access to the hospital of Saint John. This is now the building which houses The Archaeological Museum. To the best of my knowledge this gate was put in place simply for access to this area. The Gate Of Saint John – This is a very beautiful gate and a very well visited one too. This gate is also referred to as the Red Gate, or Red Door. The reason for this, is during times of conflict, lots of soldiers lost their lives here and during the bloodshed the stones were colored red. You can see why this gate has the attraction of visitors. It has an important historic meaning and here you can really feel the history surround you. 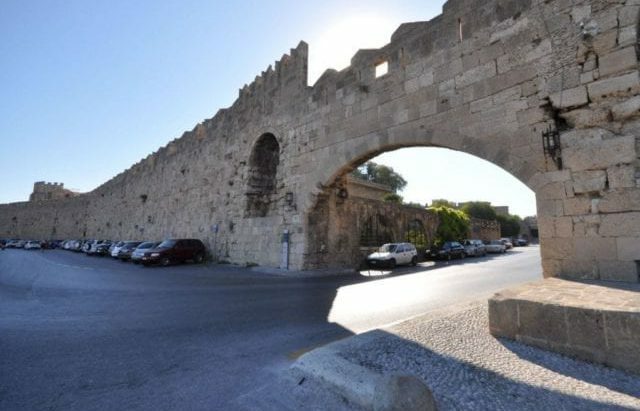 Gate Of Saint Catherine – This gate is also referred to as the Gate Of Agia Aikaterini and is a small gate located on the corner near what is now called The Tourist Port. It was built in 1357 by Grand Master Dieudone De Gozon. The gate is also referred to as The Windmills Gate! Gate. The reason for this is the church which is located outside of the gate is called Saint Francis Church! It was built from 1440 to 1442 but after the invasion of the Ottoman Empire, Suleiman had the gate closed from then on. This was to avoid any potential threat from an invasion against him, and for nobody to be allowed to follow his entrance into the city. The gate remained close until 1922. 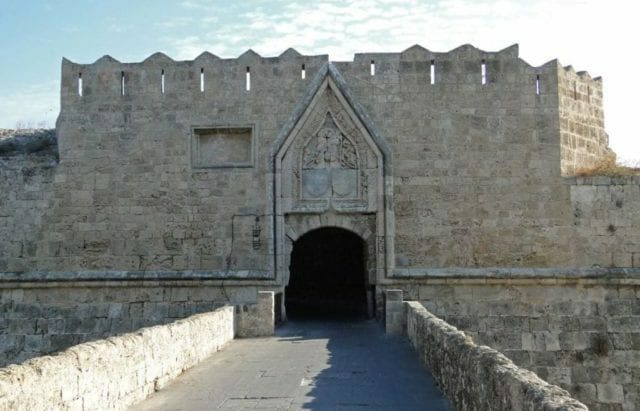 The Italian Forces opened the gate to commemorate 400 years since the Ottoman Empire had conquered the island of Rhodes. located near The Palace Of The Grand Masters. It has a huge protected approach path, two gigantic towers and a very solid entrance. The name of the gate comes from the Grand Master Emery D’Amboise, as it was during his term that it was constructed on the North West corner of The Medieval City. Acandia gate – This gate was another one used to make connections to the commercial harbor. The Italians opened this gate in 1935 and a new road was also established to connect the gate with the Virgin gate. It is located on the South East area of the Old City. As you can see the walls and the gates cover a large area. All together the walls and gates combined cover a distance of 4 Kilometers and have kept The Medieval City safe and secure in past conflicts. 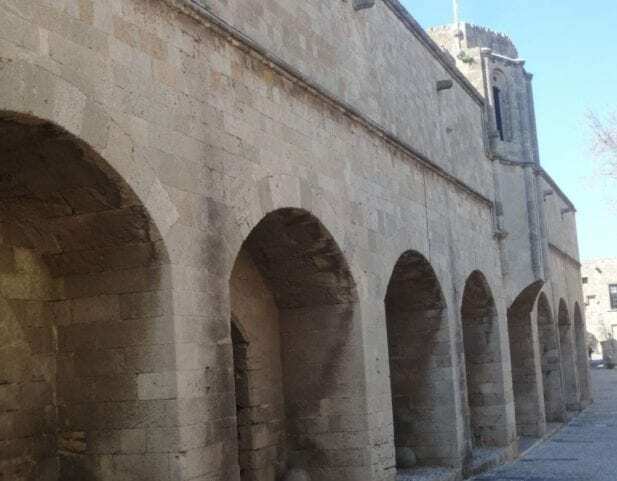 Naturally something of this quality in architecture is strong, and this is why it still stands here on the island of Rhodes in all its glory even today! So what are your thoughts? Do you think it would be a place to attract you for a visit? I would love to know your opinions. Hey, maybe you have even been here before – If so feel free to leave a comment below with a little information on your experience. Thanks so much once again for reading. Oh my, I would LOVE to explore this old ancient city. One of my favorite things about travel, is visiting walled cities and passing through the various gates to get inside of the surroundings. There is always a somber feeling when passing through any gate, wondering about the people who walked the same path. In times of war and times of relative peace, how had those people felt when walking under the same arches? How many hundreds of thousands of feet have trodden the same stones over the centuries? Hi Laurie, thanks for your comment. I feel the same way when I am in the vicinity of the Ancient City Of Rhodes. The place has a history dating back centuries, so it is not hard to imagine the events which have taken place here. Soldiers riding to and from battle on horses, blacksmiths at work and people out trying to get by. They have all passed through the gates of the old city. I find it a fascinating location, and although today it has been made into an attraction for tourism, the history still stands strong. 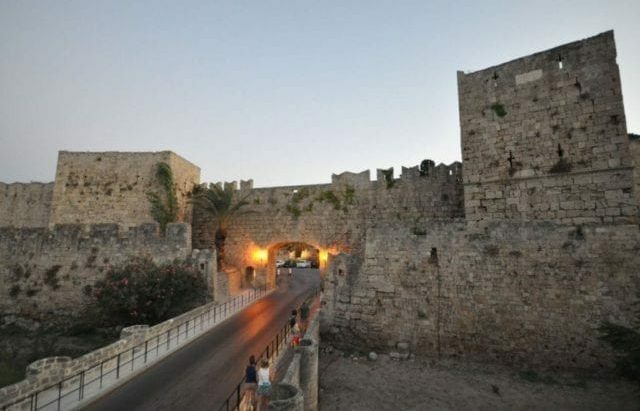 The walls and the gates of Rhodes Old Medieval City are really dominating. It is a fabulous piece of architecture. You should definitely come to see it one day! Thanks Laurie. It is great to hear from you. Chris, I enjoyed learning about the history and layout of old Rhodes on your post here. I’d love to take a tour through there one day, the pictures you have are beautiful. In general, I think castles and old buildings are really cool. Definitely never get to see anything this old living in America. This looks like a place worth visiting to me. Hello there and thank you for passing by. I am happy the information here gave you some interest. If you ever manage to get a trip across the Atlantic, you should see Greece for sure. The history will blow your mind. 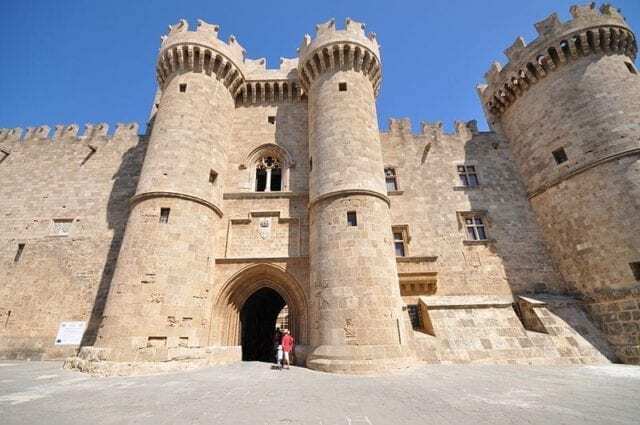 The island of Rhodes is a hot spot for tourism and if you love old structures and castles then this will be perfect for you. Certainly The Medieval City that lies within the huge walls you read about here is not to be missed! Hi Chris, thank you for the information about this Greek beautiful island. I am just looking for a holiday escape with my family and I wanted something like this, where you combine sun, culture, food and welcoming people. It helped me a lot to decide when and how to plan my trip to Greece. These Walls of The Medieval Town look amazing. They seem to stand tall and persuade you to want to come in through the gates. Hello Maite and thanks so much for visiting me here. The Walls of The Medieval City really are awesome. Just to stand and look at them in all there glory, well – they are quite a spectacle I can tell you. 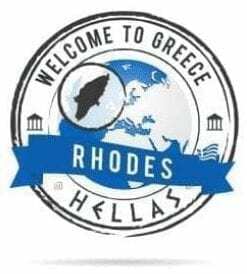 I hope you and your family manage an escape from your routine soon, and if you manage to land in Rhodes please let me know 🙂 I will be happy to help you out with the best places to go and things to see! This is one of the most unique pages I have ever seen. What a great way to go after and help people. 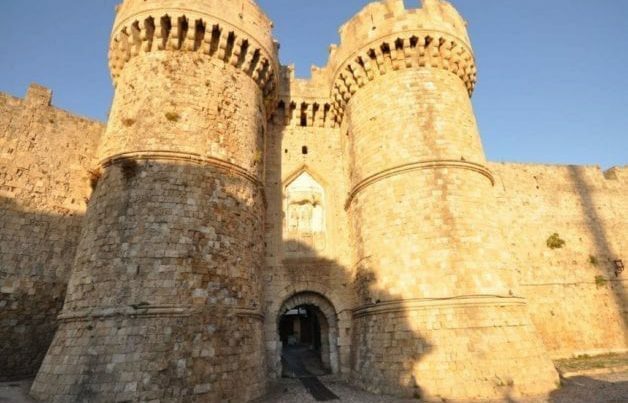 Rhodes looks like an amazing place and a tour guide seems a needed item. Anyway, I didn’t know much about Rhodes until I was brought to this article. I personally have never been aware of how great and historic this island is. I would love to have the chance to see this fantastic ancient walls and entrance gates. I am actually going to Europe very soon and I will make a great attempt to make it to the island of Rhodes. To be honest that was my aim when I decided to build my website. I remember when I first came to Rhodes. It was sometimes a struggle to find the information you wanted. Yes, there are tour operators here that can help you, but I wanted to have my own personal guide for me to read and make my own way around (and in my own time) – and there was very little on offer. This was my full intention on this website. I wanted people to have a resource at their fingertips so they could get the most out of their stay. Of course, The Medieval City and The Walls and The Gates are important. There is so much more coming though and I am in the process of developing a lot more material. It will be here soon. Chris, you have done it again! 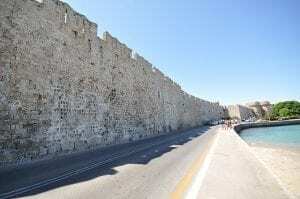 The Walls And The Gates in Rhodes is another one of your incredible articles, the history is just amazing. Any other suggestion for me in this same area on the island? Thanks Brendon, it is very satisfying for me to know that you enjoyed the material here. You know, I have lived here for many years, and I still walk around and notice things I had not seen before. There is so much packed into this place, I am sure it can never ALL be full appreciated. For this reason, many people come back year after year. They stay in a different area so they can experience different places. There is so much to see and do. 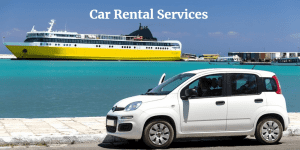 As for staying in the same surrounding area as The Medieval City, you will also be on the doorstep of Monte Smith. This is also very much worth a visit as the old stadium and The Temple Of Apollo are also “must see” locations. You can read more on Monte Smith In Rhodes here. I am sure you will like this one too. Thanks Brendon, and you know I am here if you need something more. There sure is a lot of history in this place. I am really impressed with the images too. They are all quite captivating to look at. I grew up in Canada, so there are no structures this old (and large) to see, and certainly no walled cities. It looks like an amazing spot with the water so close. 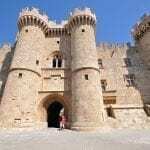 The history in Rhodes is certainly an in depth subject, and to be honest,in a lifetime I am sure you still could not discover everything. The Walls and the Structures serve only as a part of all of it, but I will agree with you when you say it looks amazing. Where ever you look around near and in The Medieval City, there is a photo opportunity. It is really beautiful! I am definitely adding this to my list of places to see, the pictures you shared are beautiful, the history behind it is very fascinating too. Your post is very informative, I like the map you shared, it’s pretty detailed and very helpful. Thanks for sharing and keep up the great work! Hi Steve and thank you for your nice words. I am happy that you found the information here enjoyable to read and you found it informative. There is a lot more coming so be sure to visit back from time to time, and if there is anything you would like to know then just drop me a line. I will be happy to help you out! I was simply blown away by your knowledge and photographs. You brought Rhodes to life for me, and those amazing gates and the wall should be more publicized, don’t you think? Wow, I guess I’m going to try planning a trip to Greece, but because it is so vast in area and history, I think it is better to choose an island, or area that appeals, and then go for it. I have to find out if my friends live within traveling distance from Rhodes. When you say the walls and the gates should be more publicized, what do you mean? You mean in general? Worldwide? Id be interested to go into that more with you. Let me know your train of thought there. Moving on from that, yes Greece does cover a massive area, and within all of these different areas there is history and culture. In my opinion you could not learn and discover everything in a whole lifetime. The world is a small place now when it comes to travel, the only thing that stands in the way of most people enjoying it is money – unfortunately! I have never heard about the Walls and the Gates in Rhodes before! I know there are many Greek islands, and have I some friends from Greece, but never particularly wanted to visit. However, in viewing your very informative and amazing site about Rhodes, I may change my mind. You know your subject, and its history, and that is very refreshing. It was also very interesting to learn about the actual makeup and configuration of the walls, and why this was necessary. 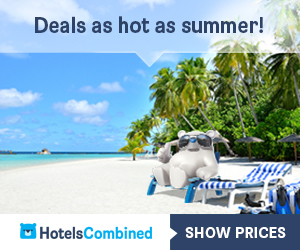 Your site functions well as both a historical and a travel site, but geography also figures in there as well. The pictures are superb, and I guess it was your intention to talk about every gate located in this wall. Hi there Pat and thank you for your kind words. I am happy you found the information here interesting. I am doing my best to convey all my knowledge into words in a way people find easy to understand. Sometimes history can be quite overwhelming, so keeping it simple is my motto! With the amount of history there is on the island (not only The Medieval City) I have a lot of work ahead of me, and I will be making additions to the project all the time, so feel free to come and take another look soon! 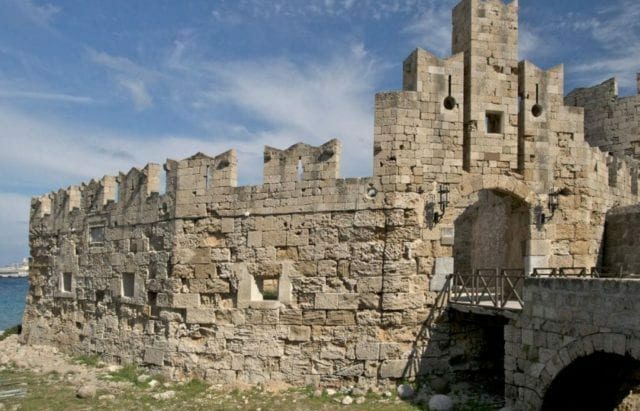 Thanks for a very informative article about the walls and gates in Rhodes! Do you know if there are any ‘secret’ passage ways or other ways “in” to the city like sewage exits or clean water entrances? Some times we hear about those type of things in these ancient cities. Hi Kristi and thanks for your question. It is a great question too, and my answer is, not that I am aware of! To my knowledge there are no sewers at all (not on Rhodes Island at all if I am right). The way the Old City was constructed was clever though. If for example there is heavy rainfall (which does happen here in the winter months), all of the streets are angled in such a way that the water flows down them. It is directed back to the harbor area and back to the sea. So with this in mind I would say there are no sewer systems. Most of the toilet facilities in the old city, and most of the island, operate with a tank. And at scheduled times the tankers come around to empty them! So again, that would hint that there are no sewer systems! Yes as far as organized goes, the Medieval City here has it quite well sorted out. There is a lot goes on to make sure the city operates well, and when things need to be kept in check, it is pretty much taken care of straight away. This is not always the case when it comes to other areas on the island, but as this is a UNESCO Heritage site, a lot more attention seems to be given to it in order to keep things right. That looks beautiful and interesting. Is it possible to just walk around all the time or are the gates within a closed area where you have to pay to get in and see them? And if you have to pay to get in approximately how much, and do you know the opening hours? Are there guided tours that takes you around and explains more? 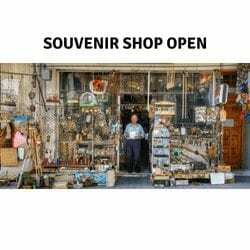 Sorry for the many questions, but looks like a place that would be worth visiting so just want to know a bit more. You can go in and out of the Old Medieval Town itself at any time you like. There are no entrance fees at all and the gates are always open. Only if you go at certain times, i.e late in the night, you may find some of the outlets closed. In the summer time, there are representatives here that can organize you a guided tour. This should be done from your tour operator who most of the time you will see here during your stay! Hope this clears it up for you Mikael. I am here if you need something more! Thank you very much Chris. Appreciate it. Just let me know if you need something else! 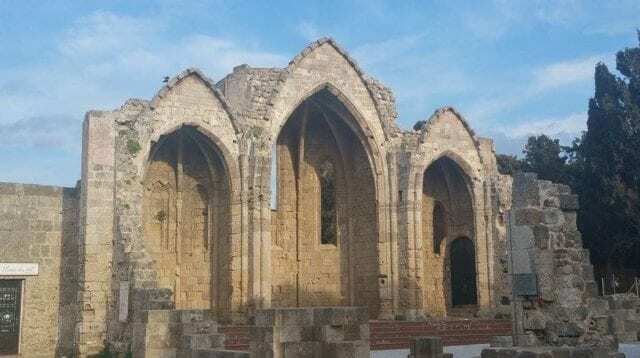 You know so much history, it’s obvious from your explanations that you love the island of Rhodes. 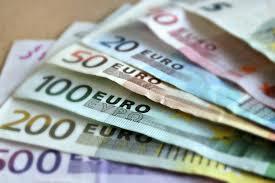 We are presently looking into the possibility of visiting Greece. There is a boat that goes there from Israel on about a weeks trip. Hi there Hannah and thanks for passing by. Yes there are a lot of options when it comes to places to visit on the island so if you need any information before you come just let me know! A lot of people come here to Rhodes from Israel every year, and I am happy to say I have made a lot of friends from there. Many of them come from Jerusalem, where are you from? Very interesting article both from a historical and travel point of view. Makes me very excited to visit the Island as soon as I can. It is fortunate that this site was not more damaged during World War 2. Was it the Italians that held this location at the time? Hi Keith and thanks for your comment. I agree yes, it is fortunate that a lot of it still stands today, but it took its fair share of hits during the battle of World War 2. World War 2 was declared in September 1939 and went on for 6 years finally coming to a close in September 1945. The Italian presence on the island lasted from 1912 until January 1943 after a battle between the Italian and German forces. The German Forces then took control of the island. You can read more on The Battle Of Rhodes here, I hope it helps you! 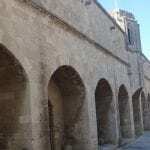 Thanks for an interesting post about the walls and the gates in Rhodes. I am currently planning a trip to the Greek Islands and considering where to go on my journey, so I have found this post useful and informative. I will certainly be checking out some of other posts on your site as well before I go, thanks. Come back regularly for updates as I try to add material on a regular basis. Are you planning a trip to the Greek Islands in general? Like a tour? I know a lot of people do this, and the ones I have spoken to always seem to have the best time.